Inspired by the great Italian tradition of quality at the table and in the glass, we are dedicated to seeking out the best ingredients for our dishes. 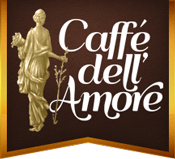 In creating our Caffè, we wanted to bring a piece of Italy to Naples, Florida. As in Italy, here you will find a small, family-run restaurant where the owners are the chefs. Our menu is not large, but what we offer is undoubtedly of the finest quality available, made with passion and love! Last reservation seated by 8:00 p.m.